The latest technologies shaping the world of mobile devices with constant updates. People are looking for faster, smarter, and brand new technologies which can enhance their lives and make it more productive. Google has recently launched Android Q Beta 1 with brand new features. Android, being the most popular platform, providing their customers with the right thing at the right time in the field of hardware and software. It brings developers with new capabilities and provides the end user with greater experience. It has broadened the horizon of brand new possibilities by allowing people to take advantage of the latest innovations. With the launch of Android Q, there are several changes has been made. Google has introduced Android Q in an early beta form. To make use of these significant changes one must check the device eligibility. If your device is eligible, you are good to make use of all the lucrative features listed below. These advanced features like faster app startups, camera capability, new APIs for better connectivity, NNAPI extensions and a lot more in the store are crafted to provide users with an exceptional experience and better device usability. Privacy Protection: – Users privacy and security is the top most priority, hence, Android was crafted keeping the same in mind. It was designed by following the user-centric approach. Now it has arrived with more privacy controls and advanced features like file-based encryption, lockdown mode, locking down the camera/mic background access, Google play protects, OS controls requiring permission to access the sensitive information providing the user with high-level protection and security. 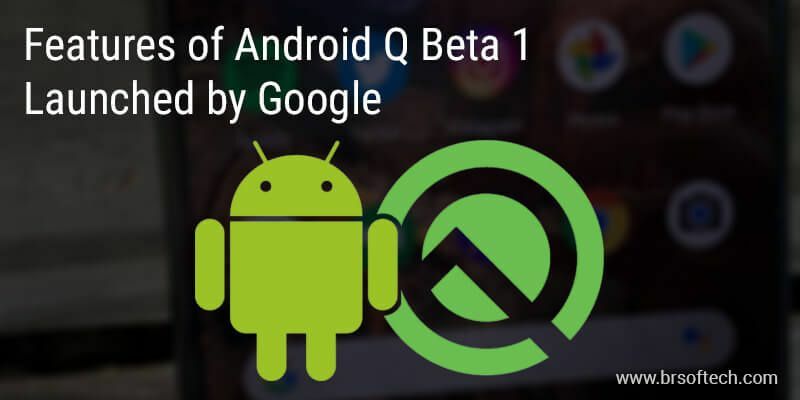 Android Q Beta 1 has made its entry with greatly intensified features. It offers greater control over various apps and their access to the shared files. With this extraordinary update, users can keep a track on the app’s access to the image and videos. Foldable Screen Support: – Get the innovative experience with this amazing foldable screen support feature. With android Q allow your apps to take advantage of these and other large screen devices. It has come up with the number of improvements including changes to onResume and onPause to support multi-resume and notify the app automatically when to focus. It allows you to manage how your app will display on foldable and large screen work attributes with resizeableActivity. Android Q Beta 1 update allows Android app developers to manage the way their apps will be displayed on foldable and large screens. Users can make the most of this upgrade. Noy just that, Android Emulator has also been updated for supporting the multiple display type switching. Control Over Location: – Android Q, the Operating System gives users access to have greater control over when apps can get the location. In older version apps can only access the location when you give permission to the app. This advanced operating system of Android Q Beta allows a user to control an app in finding his/her desired location. With the advancement of technology, this upgrade gives you multiple options to user get permission before sharing your accurate location. The 3 options user gets are Allowed all the time, Allow only when the app is in use, and deny while asking for device location. This user-centric improvement gives developers the support and user facility with these changes. Sharing Shortcuts: – Get Improved share menu with quick sharing opting with the recent upgrade. This recent upgrade makes sharing easy with sharing shortcuts of Android Q. It allows users to directly switch to another app for sharing content. The motive of this upgrade is to complete the process of sharing content at a faster pace without impacting the device performance. Sharing shortcut will work the same as App Shortcut. It allows developers to preload sharing shortcuts in advance for quick sharing and a better user experience. The expended Shortcut into API make the integration easier and support the new ShareTarget Android X library. Setting Panels: – Access system setting more easily with the Setting panel API. The setting panel API takes full advantage of slice features that was introduced in Android 9 pie. The inclusion of setting panel API shows the key system settings directly in an app’s context. It refers to a floating UI, which can be evoked from an app to show the system settings that user might need such as internet connectivity, audio volume, and NFC. Media, Camera, and Graphics: – Get dynamic depth images with Android Q Beta 1, which will acquire the ability to request the dynamic depth images. It consists of XMP and JPEG metadata for the depth element as well as the confidence map included in the same file. It helps in offering specialized blurs and broken photos with 3D images. Improves ART Performance: – Android Q Beta 1 introduces various improvements to the ART runtime. It helps apps start faster and consume less memory without developer support. The Google play has now provided by cloud-based profiles with APKs. It give apps with a significant jump start to the overall optimization process. By optimizing the Zygote process, Android Q Beta can start an app’s process and transfer it to a security container so that it can buck up instantly. Faster App Launches: – Emergence of technology bringing the dynamic changes like opening apps has become a lot faster and easier with Android. With this time-driven technology and introduction of Android Q Beta 1 developer have gained access to process an app data subsequently sent it to the security container so it becomes absolutely ready to launch. Wi-Fi Performance Mode: – Android Q adds support for peer-to-peer connections. This feature enables your app to prompt the user to change the access point that the device is connected to. It might ask to make required changes in settings like switching to an ad hoc Wi-Fi network when setting up a smart home kit and in Android Q you do not have to jump over to the settings and back again. It ensures high performance as well as a low latency mode for different wireless connections. Better Compatibility: – Another thing which is being taken care of in the up gradation process is to run apps as smoothly as possible. Android Q has restricted access to more non-SDK interface and asking you to use public equivalents. Plenty of things are scattered through Android Q. Now you can force desktop mode when another screen is attached. It has come up with deeper access to photo effect and a native Android Q recorder. There is more to come, from which users can take full advantage. You can now get a better network connection with great WiFi performance. It has introduced some of the great beneficial features for the user which can actually make a difference in the daily lives of the user as well as developers. It has offered soft keyboard controller enhancement with user-defined accessibility timeout. Now you do not have to deal with bugs anymore, it improves debugging of file descriptor ownership.